Eric Zimmerman, the co-author of Rules of Play wrote this tongue-in-cheek article about how narratives and gameplay work together. Please tell us what you think. Agree? Disagree? Any interesting concepts? So sometimes these terms can mean what we want them to mean, they are so open to interpretation. Zimmerman points that out as well as giving us some examples, Ms PacMan, "there are many story elements to Ms. Pac-Man which are not directly related to the gameplay." It is after all a struggle about life and death, about running for your life and turning to fight or devour those threatening you. The "hunter becomes the hunter," and he argues that is something only a game could tell. 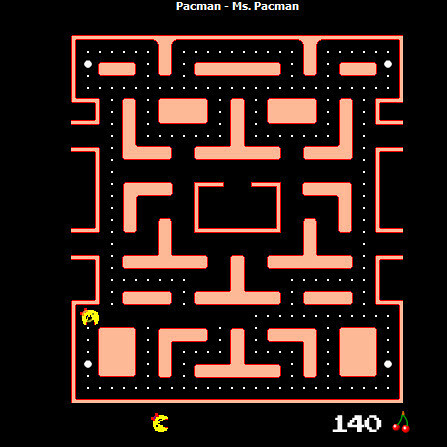 Ms PacMan is also a character that has jumped medias, to t-shirts, collectable items, such as throw pillows. In case you have forgotten, you can play it on line, it originally came out in 1981. Play it and then comment here regarding Zimmerman's observations and yours about those four comments. In case anyone forgot here is that "unforgettable" screen. Well, I liked this article because the author basically proves my theory that all games are narratives (see my post in the "Narrative is not a game mechanic?" forum). Just had to jump in her Mina ZedWord, before I start grading my student's online submissions, and say I totally agree that all games are narratives. Some are not totally planned to the finish, as in child's play. When I was playing with my Teddy Bear, and we were going for a walk, I didn't pre-write in my head where we would go, what we would see or where we would stop. "Oh, look a bunny rabbit." Was that the Easter Egg the universe put into my game? I feel that the terms defined were dead on. I also agree that the article confirms the premise that all games have narrative. Without narrative there will be no engagement in the game. Sometimes that narrative is not implicit and is supplied by the player like with battleship. There is a battle in every game but who is fighting who and why is supplied by the player.